With tens of thousands of educated Afghans fleeing the country, an imminent brain drain threatens the reconstruction of Afghanistan after 2014. It’s a Saturday afternoon in San Francisco’s Haight District, and Afghan Friends Network’s (AFN) board members have gathered to do an important job. An Afghan spread of roat, nuts and raisins is set before them. The refreshing aroma of cardamom-flavoured green tea travels from the kitchen of the four-story Victorian house to the dining area, where they work on the large circular table. Teenage girls sit around the kitchen table singing American pop songs. Humaira Ghilzai is the co-founder of AFN, a tiny nonprofit manned by an all-volunteer team which funds three schools in Ghazni, Afghanistan that provide education to about 750 students. The group also employs teachers and administrators, teaches 80 women to read, and provides scholarships to students to further their education. They do this with $78,000 a year, 90 percent of which is spent on projects in Afghanistan (the other 10 percent pays a lawyer to look after their taxes, marketing and online presence). On this foggy Saturday, the board members are here to plan the theme of their next annual fundraiser. They also discuss activities in the Ghazni schools while Ghilzai’s teenage daughter Aria and her friends do the old-fashioned but important task of stuffing envelopes with letters to donors asking for money to support the organization’s work. Ghilzai’s family fled Afghanistan in 1980 when she was 11 years old, but it wasn’t until she was in her 20s that she wanted to help the country she had left behind. The mother of two has worked in technology and as a style consultant and blogger, but nothing has been more rewarding than managing AFN. She has traveled to Ghazni three times to monitor the schools and meet with teachers and students. Ghilzai’s family was among the six million Afghans who fled the Soviet invasion of 1979, which created the largest refugee community in the world and signaled the beginning of a severe brain drain from Afghanistan. The majority of this wave settled in neighbouring Iran and Pakistan. At least two million returned after the Taliban were ousted in 2001 (including thousands of wealthy Afghans who had made a life in developed countries), joining those who had stayed put in Afghanistan through the decades of war and were finally getting a chance to go to school and work again. A small percentage of the young men and women who make up the majority of the 30 million strong population have flourished in the last 12 years. They have become professionals, technocrats, Fulbright scholars, political analysts, entertainers, journalists and entrepreneurs. NATO troops are leaving, with only a small garrison of American boots remaining on the ground after 2014 to train Afghan soldiers and to prevent al Qaeda from gaining strength in Afghanistan. The foreign media’s presence is likely to decrease at the same time, along with the Afghans who have the means to get out – leaving those behind to deal with the problems of human and capital flight. The media’s post-2014 predictions are pessimistic and omnipresent, and fears of a looming and bloody civil war and the return of the Taliban are driving out tens of thousands of Afghans. Those who flee Afghanistan list security as the number one reason, followed by a lack of long-term employment prospects. The urban educated are headed to western countries – more than 36,000 Afghans sought asylum in 2011 according to the United Nations High Commissioner for Refugees. Afghan diplomats, students studying abroad and those traveling for training and seminars are defecting to foreign countries, while those without the necessary money and contacts are settling in bordering nations again in search of employment. They are all, like Ghilzai, becoming part of the Afghan diaspora, and the burden of Afghanistan falls on their shoulders. Those who will remain in the country – the poorest, least educated and a minority of the elite who swear to stick it out – are reaching out to the diaspora for help with jobs, education and information. Can those in exile meet the needs of their forgotten nation? Omaid Sharifi, the regional manager for Tawanmandi, a civil society organisation in Kabul, is ambivalent about the diaspora. He himself has decided to stay in Afghanistan: “It is tough to fill the shoes of the accomplished ones in a country with a very high rate of illiteracy. However, the Afghan diaspora can be active in lobbying for human rights and fund-raising for civil movements in their European and American capitals,” he says. In February 2014, activists abroad teamed up with those inside Afghanistan to prevent a setback to recently introduced and hard-fought for policies that allow women to seek legal redress from domestic abuse, underage and forced marriage. Parliament had proposed a bill that would have forbidden women from testifying against family members, effectively rendering the new law ineffective as most domestic violence occurs within families. However, in the face of sustained pressure from rights groups and advocates, including from many Afghans abroad, President Hamid Karzai vetoed the bill in February this year. For citizens of conflict zones throughout the world, diasporic communities have played crucial roles in rebuilding the economy of the home country. Afghan exiles and migrant workers have been sending money to families inside the country since the Soviet invasion, when their impact was limited because most Afghans were disconnected and dispersed across the globe. The advent of satellite TV and social media in the last decade has brought the diaspora closer to those inside the country. Afghans are communicating transnationally, and those who live on the outside are in daily contact with their compatriots at home. Afghanistan media companies like Ariana and Tolo TV target some of their programming for the diaspora. Activists reach out on Facebook and Twitter, posting events from some of the most remote areas of Afghanistan. This interaction makes it easier for the diaspora to open an NGO from afar, to run a business, to change laws inside the country. Diaspora success stories include that of Afghan media mogul Saad Mohseni, whose Tolo TV and other broadcast television and radio programs are the most popular in the country. Mohseni commutes to Afghanistan from Dubai, but he’s part of the booming, cutting-edge media industry that is changing mindsets and setting social trends. It’s hard to follow in Mohseni’s footsteps. Hundreds of well-meaning Afghan exiles have failed to sustain productive partnerships with the Afghan government, nonprofit or business investments in the face of corruption, ineptitude, a dearth of funds and violence. They also confront the distrust and bitterness from Afghans left behind. ‘Dog washers’ is the name given by Afghans to their compatriots in the West who have gotten high positions in the Afghan government simply because of their foreign passports. Those foreign passports have resulted in large international salaries, while Afghans working alongside them receive a tenth of the money. Their distrust is understandable. Many Afghans now living abroad are doing so on the proceeds of embezzled development money. The US has arrested several Afghan-Americans for crimes committed in Afghanistan, including bribery, bid-rigging for construction contracts and drug smuggling. “Some Afghans blame the diaspora for getting extremely high salaries, and accuse them of having no love and respect for the country and their culture. They are called the cowards who left Afghanistan alone for a better life,” Tawanmandi’s Omaid Sharifi says. The criminals cast a shadow on the genuine do-gooders who spend their own money paying to travel to Afghanistan and hold fundraisers to run clinics and schools. Dozens of NGOs and for-profit projects that provide jobs are founded and operated by Afghans from North America, Europe and Australia. Afghans settled abroad in the West say their efforts alone may not rescue Afghanistan – the country needs effective institutions and security – but they are making a small difference. If more Afghans become active and involved, then the Diaspora will become a serious force for change in the long term. Any change in Afghanistan is going to take time, they say, and after the international community and aid organisations have found another trouble spot and moved on, it may be the case that only the Afghans abroad have the tenacity to continue helping. The Afghan diaspora is as diverse as the population which remains inside the country, and often as divided. Among the older generations the same ethnic and religious rivalries – Tajik-Pashtun, Shiite-Sunni, Farsi-Pashto – surface in organisations and collectives formed to aid Afghanistan. Even the Afghan Coalition, an umbrella organisation in the San Francisco Bay Area (where the largest community of Afghans in the US resides) struggles to unite community leaders because of these schisms. But trends are changing among the younger generation of Afghans who have grown up outside their country, just as things are changing inside Afghanistan. Many of the Afghans born in the US or Europe do not hold the same prejudices and grudges as their parents, and tend to be more pluralist and egalitarian. The motivation to remain engaged and active is personal for each individual and can come from a sense of responsibility, survivor guilt, or be used as a way to soothe displacement and foster belonging. Esmael Darman, a psychologist, was a medical doctor in Afghanistan. Born and raised during the Soviet occupation, the softly-spoken 31-year-old won a Fulbright scholarship in 2008 and studied psychology in the US. He sought asylum and his case was approved, but his work continues to revolve around Afghans. Darman has created the first mental health website for Afghans (rawanonline.com) which tackles taboo issues like depression and sexual assault in both Farsi and English. Nearly 12,000 people visit the website daily, most of them from Afghanistan and Iran. For other Western-based Afghans, the homeland has become their calling. Mina Sharif, 33 was a year old when her family migrated to Canada to escape the communist invasion. But when she graduated from college in Canada with a degree in communications, she headed straight to Kabul. Sharif has trained women in radio broadcasting, taught English to cooks and guards, and most recently, helped produce Bagche Simsim, Afghanistan’s version of Sesame Street. She first left Canada in 2005 and returned a few months ago because she was getting ill. She’s anxious to return despite her family’s objections. Even if she stays in Toronto, the advocate will find work related to Afghanistan. 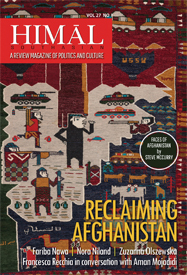 ~This article is a part of Reclaiming Afghanistan: web-exclusive package. ~Fariba Nawa is a San Francisco Bay Area-journalist, speaker and author of Afghanistan, Inc. and Opium Nation, and has traveled and worked in Afghanistan and the region for seven years.